The goal of financing the Department of Recycling and Materials Management is to enable the development, maintenance, and sustainability of an integrated solid waste management system that facilitates recycling, composting, waste reduction and other diversion activities to the greatest extent possible. Where possible, the financing system is also designed to create incentives for diversion of materials from disposal. The Department’s yearly budget is comprised of seven programs: disposal, recycling, recycling collection, waste reduction, old landfills, administration, and household hazardous waste. See the revenue, expense and fee history graphs for more details. 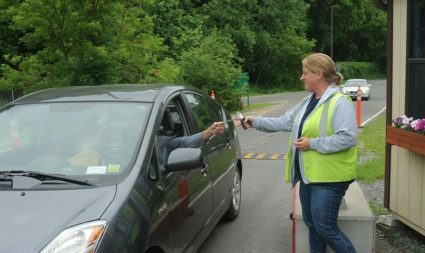 Disposal Fees: The Recycling and Solid Waste Center (RSWC) accepts waste from Tompkins County residents, businesses, & licensed haulers and charges disposal fee to do so. Solid Waste Annual Fee: The annual fee helps to defray the costs of the County’s Solid Waste Program, exclusive of trash disposal. The annual fee pays for the Recycling and Solid Waste Center, curbside recycling collection, waste reduction programs, Household Hazardous Waste, and maintaining closed landfills. Recycling Revenue: The Dept. of Recycling and Materials Management receives recycling revenue from the sale of recyclable materials. Grants: The Department actively seeks available grants to defray some of the cost of its programs. Miscellaneous Revenue: Other forms of revenue include the sale of recycling and compost bins, fines, permits and licensing fees. Want to stay up to date with recent news and updates? 7:00 AM TO 3:30 PM, MON. - SAT. 8:00 AM TO 4:30 PM, MON. - FRI.